The Kids In The Kitchen Program: Promoting Child Health and Wellness. Junior Leagues’ Kids in the Kitchen is an association-wide initiative of the Association of Junior Leagues International (AJLI) designed to help communities address the urgent issues surrounding childhood obesity and poor nutrition. Educating both children and their families is key to alleviating this growing problem. The program was launched in 2006 by Junior Leagues in over 225 communities, and in September, 2012, the Junior League of Akron was proud to launch its first Kids in the Kitchen event. 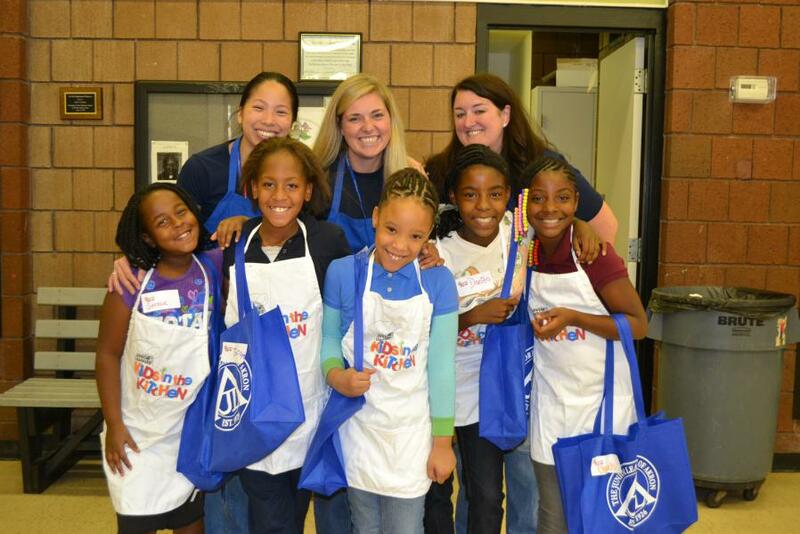 The Junior League of Akron is currently partnering with the Boys and Girls Club of the Western Reserve to hold multiple Kids in the Kitchen events each year in order to teach children about nutrition and fitness through interactive lessons, projects, and activities. Because the events are offered to the same group of students, the snacks and activities are designed to be different for each event but utilize the same structure. Focus project volunteers (JLA) set up a series of stations, roughly four for each event, with two dedicated to nutrition and two dedicated to fitness. The Community Outreach Council continued work on our second year of the Kids in the Kitchen program during the 2013-2014 league year. The children enjoyed learning about how germs are spread through the use of glitter, tasting different types of fruits and veggies, muddling fruit for healthy beverage options and learning how much sugar is in popular beverages. They also had fun participating in freeze dance, chair aided relay and breaking boards with TaeKwondo Master Choi. In addition to the focus project, league members also volunteered time with the LeBron James Family Foundation, Akron Canton Regional Foodbank, Summit County Children Services, Stan Hywet Hall and Gardens, St. Bernard Hot Meals, Stand Up for downs, Akron Children’s Hospital, American Heart Association and the Andrea Rose Teodosio Foundation . At close of the 2013-2014 league year, membership devoted over 380 hours to volunteering and bettering our community.